that I understood that there was a voice. It is not that I copied his voice; I would not dare. But he gave me permission to find a voice, to locate a voice, that is to locate a self, a self that that is not fixed, a self that struggles for its own existence. via Leonard Cohen’s Prince of Asturias Awards Speech. Following his nomination for the Prince of Asturias award. Poetry comes from a place that no one commands, that no one conquers. So I feel somewhat like a charlatan to accept an award for an activity which I do not command. In other words, if I knew where the good songs came from I would go there more often. 1965 NFB documentary on Cohen. 2005 movie tribute to Cohen with performances by Beth Orton, Nick Cave, Martha and Rufus Wainwright, and U2. 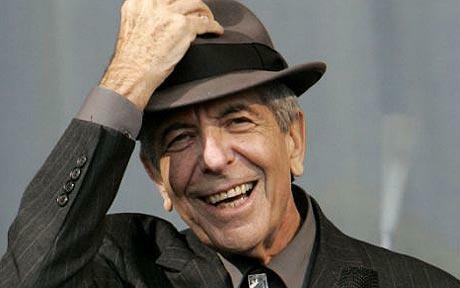 La poesía cantada, esas novelas de seis minutos y pico, la prosa mecida por inconfundibles melodías folk le han valido al músico Leonard Cohen (Montreal, 1934) el Premio Príncipe de Asturias de las Letras. Por sus canciones de marcado carácter literario, sí, pero también por su obra no cantada, libros como Flores para Hitler, Los hermosos vencidos, Comparemos mitologías, o la novela El juego favorito.